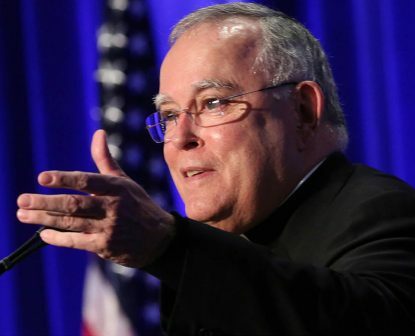 You Bishop Chaput are in my prayers to Our Lady of the Flame of Love. Pray to her daily. I will include all priests in my prayers to her as my birthday present on Saturday. What is not needed is more public guidance from any bishop on what Pope Francis should do. As Pope Francis said what is needed is prayer and silence! The pope hasn’t been accused of on-going cover-up. He was a Cardinal Archbishop of Buenos Aires for many years when he took public buses into the ghetto to be close to the poor. He didn’t even have the 2002 Charter, yet no cover-up? Only a retired archbishop who lost his job speaks scurrilously of Pope Francis. Luke 17:2 nicely gives perspective to the righteous bishops: It would be better for such a person to be thrown into the sea with a millstone round the neck than to be the downfall of a single one of these little ones. Oremus pro invicem. I agree wi ththe archbishop. now is the time for agressive action. There should be only one item on the agenda—zero tolerance for any kind of abuse or assault by members of the clergy. When I was a public school superintendent I had a simple rule for students and staff: A school is not a safe place to commit a crime. Then have the COURAGE to call law enforcement. Wherever you find human beings you will find disaffection and corruption. It is not peculiar, let alone singular, to the Church. That so much corruption has been exposed is disheartening and wounding.. Nonetheless, let the truth be exposed. Let those responsible take the fall. There is talk about how the Church will survive. Church History nails it for us: Whatever the corruption, whatever efforts on the part of some prelates to sink Peter’s vessel, it remains afloat. This is not the result of human agency but the sustaining power of the Holy Spirit. In the end, the Holy Spirit prevails. The Church may take a lashing. It may be reduced in numbers. But the good seed will always grow anew under the guidance of good and holy servants. God bless our Archbishop! Where he leads, I will follow – gladly!